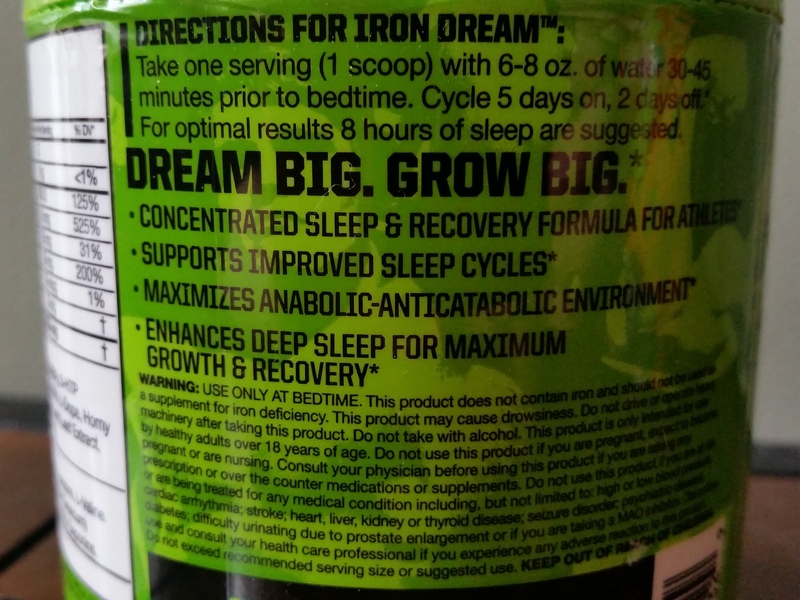 Iron Dream Review - Stronger In My Sleep? I was introduced to Iron Dream by a friend who is a powerlifting champion. This is the first sleep supplement I’ve tested with “dream” as a part of the name, and it does the name justice (more on that later). I usually prefer more “natural” supplements to supplement my sleep, but was intrigued by possibility of a product that would not only help me sleep, but also help me recover better and get stronger. A concentrated nighttime recovery supplement designed to support improved sleep cycles, maximize anabolic-anticatabolic environment and enhance deep sleep for maximum growth and recovery. 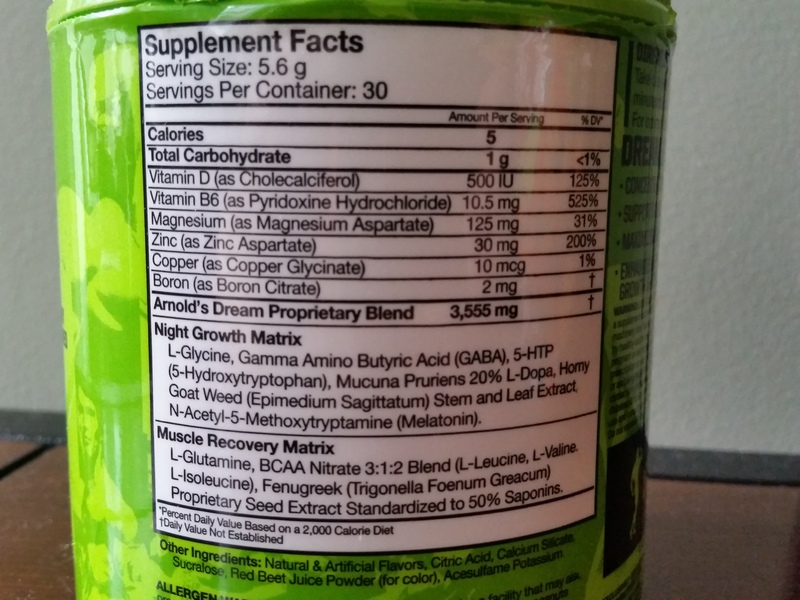 This product is a part of Arnold’s “signature” line of supplements for Muscle Pharm, and the Iron Dream was created as a blend of two ingredient stacks: Night Growth Matrix and a Muscle recovery Matrix. L-Glycine — This amino acid works in conjunction with taurine and GABA to facilitate neural impulses. It is also responsible for signaling human growth hormone secretion. Gamma Amino Butyric Acid (GABA) — This neurotransmitter produced by our brain is directly related to both reducing “excitability” in the nervous system and muscle growth. It’s used in some other sleep supplements I’m hoping to try soon. 5-HTP 5-Hydroxytryptophan — A byproduct of tryptophan, this chemical helps increase the production of serotonin, and has been used to treat insomnia, mood-disorders, migraines and binge eating. Note: May not interact well with some medications. It is a good idea to talk to your doctor before taking this supplement if you also take anti-depressants. Mucuna Pruriens 20% L-Dopa — This plant has been used for centuries in Ayurvedic medicine to treat anxiety and arthritis. Studies (like this one) also suggest it this plant may be able to support and in some cases even restore testosterone production. Horny Goat Weed (Epimedium Sagittatum) Stem and Leaf Extract — This herb has been used by men to aid in sexual health, and it also contains phytoestrogens, chemicals that act somewhat like estrogen, and can help postmenopausal women combat bone loss. N-Acetyl-5-Methoxytryptamine (Melatonin) — This is one of my go-to sleep enhancers, and I’ve reviewed a few supplements that contain it in various forms. It helps me fall asleep faster and experience more restful sleep. I especially like melatonin because its effects don’t diminish with repeated use (and studies back up my experience). L-Glutamine — This amino acid has long been used to treat depression, insomnia, and to aid exercise performance. It is also known to help reduce muscle catabolism — the process during which lean muscle tissue breaks down. BCAA Nitrate 3:1:2 Blend (L-Leucine, L-Valine, L-Isoleucine) — Branched Chain Amino Acids or BCAAs are critical to growth and recovery of muscles, by promoting an anabolic state. Fenugreek (Trigonella Foenum Greacum) (Proprietary Seed Extract Standardized to 50% Saponins) — This plant has been used to treat a number of ailments, including male sexual dysfunctions, and to help breast-feeding women increase milk flow. It’s stated purpose in this supplement is to improve sexual health in both males and females. In addition to the above, the supplement contains Natural & Artificial Flavors, Citric Acid, Calcium Silicate, Sucralose, Red Beet Juice Powder (for color), and Acesulfame Potassium. The bottle’s directions suggest that you mix one serving scoop into 6-9 oz. of water and drink it 30-45 minutes prior to bedtime. The powder had a strong artificial smell ( I had the Fruit Punch flavor), so I mixed one scoop of the powder into about 2 ounces of cold water, just in case I loathed the taste, and had to chug it. The color is a pretty pink and the flavor is reminiscent of a cherry or strawberry-flavored Blow Pop gum. When bedtime came around, I fell into deep sleep quickly and slept for 8 dream-filled hours. 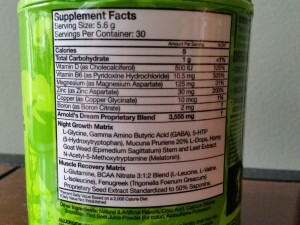 As I mentioned in the beginning of this review, MusclePharm had the right idea when naming this product. The dreams I had were vivid, and while sparing you the details, I will mention that they involved two Arnolds (Terminator and Governator) and me having a total breakdown after a botched haircut. Despite the comical dreams, I woke up alert and rested, and at the same time quite relaxed. I imagine less than 8 hours of sleep would leave you wanting more after taking this product. 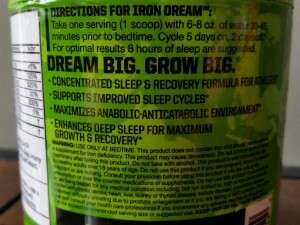 As both a sleep supplement and recovery aid, Iron Dream worked for me. 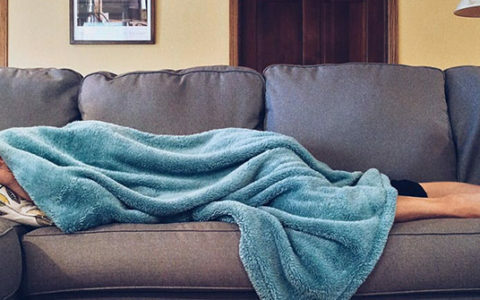 If you are looking for an effective sleep supplement that will induce, deep and restful (albeit amusing) sleep, and also help you recover after tough workouts, this could be a great option for you. I find it difficult to imagine taking it every night, mostly because of the strong artificial flavor. I will use this supplement on nights where I have had a harder workout, or feel like I need little extra help recovering. Any idea why you have to cycle the stuff? Hi Aaron! That’s the manufacturer’s suggestion, and it’s something I’ve seen before with supplements that contain 5-HTP and/or GABA. 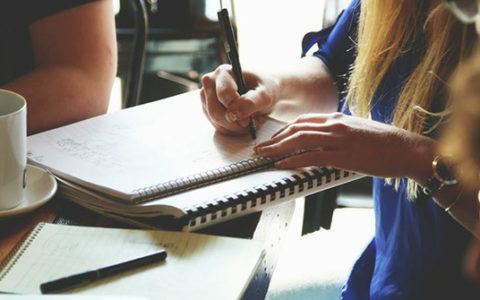 Supplements that have dopamine, serotonin, or other neurotransmitter-boosting ingredients often suggest this to allow the body and brain to reset a baseline. In my experience, Iron Dream’s effects tend to be less pronounced if I don’t cycle it. This product says it increases REM sleep and that seems like the truth by what you commented by having vivid dreams. But REM sleep does not repair wear and tear of the body from the day which seems like the purpose of this product. Deep slow wave sleep is responsible for repair. And if it increases REM sleep then slow wave sleep decreases so then by that logic it wouldn’t aid in recovery.